Let's get started! 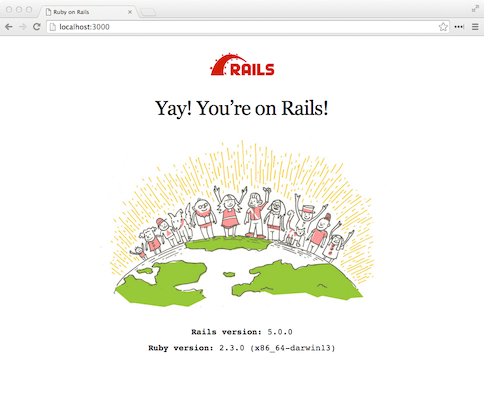 By the end of this step, we'll have a brand-spankin'-new (empty) Rails app. If you have any problems, call over a TA. A directory is the same thing as a folder. 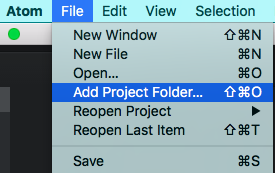 This command creates a new directory for us to store our project in. Check to see if you have any existing suggestotron apps from a previous workshop. It lists the contents of the current directory. rails new creates a new Rails project with the name you give. In this case we told it to create a new project called suggestotron. We'll go into detail on what it created shortly. This will print a lot of stuff to the screen and can take a while to finish. 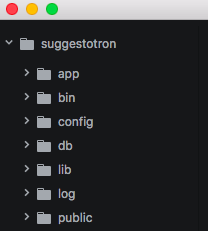 Open the suggestotron folder as a project in your text editor. Close any files that are already open. They might be from yesterday's test_app, and we want to make sure that we're editing files in today's suggestotron app.